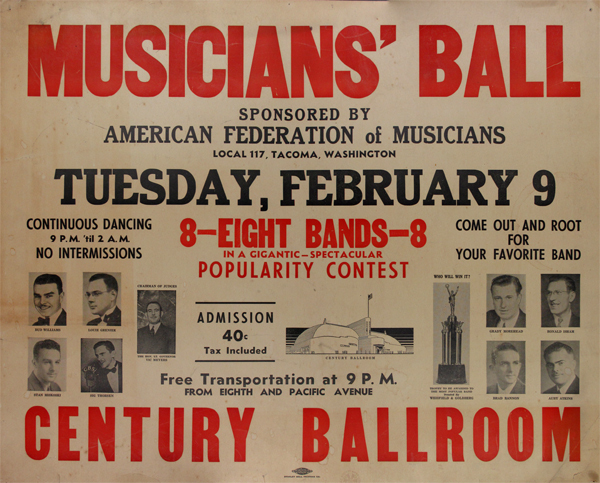 ON THE EVENING of February 9, 1937 eight big-bands from the Pacific Northwest competed in what was promoted as the "first annual" Musicians’ Benefit Ball. Sponsored by Tacoma’s American Federation of Musicians (AFM) Local 117, this stunning – and recently acquired – promotional poster is a surviving artifact of the event. The dance was held in Fife, Washington at Rocco “Mac” Manza and Jimmy Zarelli’s Century Ballroom (1406 54th Avenue East) on the old “Seattle – Tacoma Highway (U.S. 99), which had opened back on December 29, 1934, and had been built to resemble the Washington State Pavilion at the 1933 Century of Progress Exposition in Chicago. The benefit gig kicked off at 9:00 pm with music performed by the host band, an eighteen-piece ensemble led by Joe Rausch. Following that, eight bands would each take turns playing for the assembled dancers from the main-stage located across the room (which boasted a 20,000 square-foot dance-floor) – with Rausch’s band playing additional songs between those 30-minute sets. The competitors were bands led by: Auby Akins, Brad Bannon, Harold Eaton, Louie Grenier, Ronald Isham, Stan Miskoski, Grady Morehead, and Sig Thorson. The contest’s promoter, Al Paige, predicted that "a record crowd is expected to be on hand to witness Lieut. Gov. Victor Meyers, head judge of the affair, present the winning band with a beautiful" trophy at around 2:00 am. Alas, we may never learn who won the battle – and thus, the title of "Champion of the Northwest" – as the Tacoma newspapers don’t seem to have published a follow-up report, and I've thus far found no references to similar dances in subsequent years!